I have been dreaming of converting our backyard into a beautiful, low-maintenance desert landscape. Right now, it has a large area of grass surrounded by large, flowering shrubs against the wall. I would have loved to have taken out the grass years ago, but my husband and son protested since they would throw the football back and forth each evening before dinner. But, now my son is almost 12 and often throws the football over the wall, so now I have been give permission to at least start thinking of converting the backyard. Often, on my way home from a landscape consult, I will mentally design my new backyard garden. I have some concrete ideas, but there is still a lot to be decided. Whenever I see a landscape area that I like, I stop to take a picture. I have quite a few pictures that I have taken of landscapes that inspire me. Red flowering Chuparosa, growing underneath native mesquite and foothills palo verde trees. A hedgehog cactus grows by a large boulder. Mexican bird-of-paradise, trained as trees are growing in the background. Goodding’s verbena, chuparosa and brittlebush blooming with creosote bush in the background. Desert ruellia provides an attractive background for golden barrel cacti. This area needs to be pruned once every 2 years. Young palo verde tree with potted artichoke agave. I am still in the “designing inside my mind” stage, but will soon need to put things down on paper. I have my drafting supplies ready to go once I am. Of course, the entire project hinges on having enough money for large containers, big boulders, trees, plants, dirt for mounds and paying someone to rip out our grass. Which one of the landscape areas above do you like best? When I am driving about town, I tend to look at the landscapes that I pass by. Usually, I tend to see some “landscape no-no’s”, which I like to share with you now and then. I love Gold Lantana and how it flowers non-stop spring through fall. When planted next to boulders, you get a great contrast in textures. What is even better about this arrangement, is how easy Lantana is to grow. Unlike many tropical climates, Lantana is not invasive in arid climates. Just water it regularly and prune it back hard in spring (6″ high), after the last frost. Periodically prune it back every 2 – 3 months, stopping pruning 3 months before the first frost date in your area. Sometimes, I see great examples of desert trees that are properly pruned. This Texas Ebony (Ebanopsis ebano formerly Pithecellobium flexicaule) is beautiful tree that is prized for its dark green foliage that is evergreen. It does have thorns and gets seedpods, but it highly prized by those who live in the Southwest. 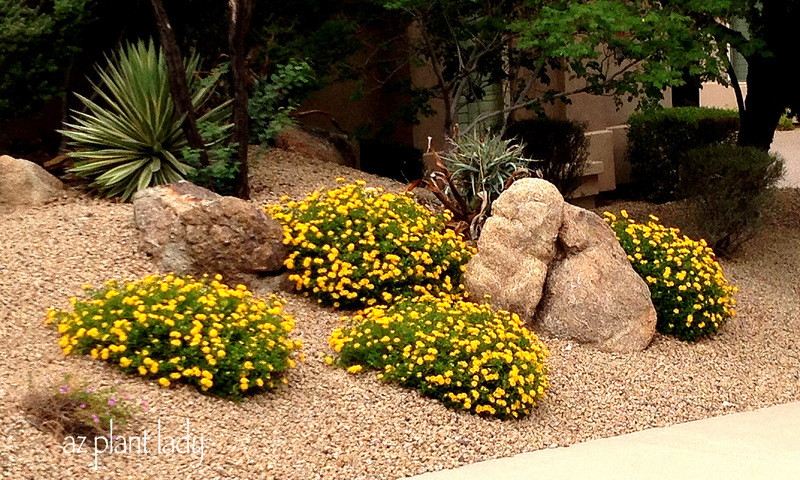 This nicely designed landscape was located next door to a house where I was visiting a client. I like how the columnar cacti flank the entry on either side. Totem Pole (Lophocereus schotti ‘Monstrosus’) is on the left and has the bonus that it is thornless. Another favorite of mine, Mexican Fence Post (Pachycereus marginatus), which is one of the few cacti that I have in my own garden. The yellows of the Golden Barrel (Echinocactus grusonii)with their rounded shapes contrast nicely with the spiky fans of Desert Spoon (Dasylirion wheeleri). **Another bonus about this landscape is that it is extremely low-maintenance. While stopped at an intersection in Scottsdale, Arizona, I noticed this distinctive landscaped area with contrasting spokes of a wheel fanning out from the sign. Different sizes of gravel are often used to add interest to the landscape by the contrasts in size. Agave and Aloe vera make up the plantings in the lighter colored spokes while Golden Barrel are used in the darker rip rap. Well, these are just a small sampling of the “landscape do’s” that I have seen lately. I hope you enjoyed seeing them and maybe will be inspired to replicate a couple of these plantings in your own landscape. 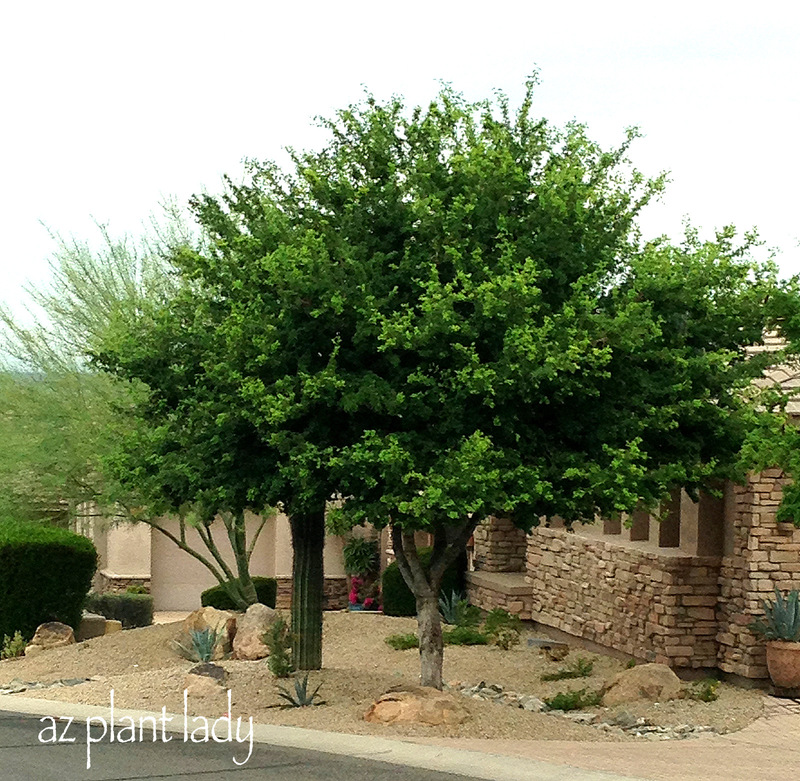 https://www.azplantlady.com/wp-content/uploads/2013/09/IMG_2076-001.jpg 384 640 arizonaplantlady@gmail.com http://www.azplantlady.com/wp-content/uploads/2018/10/favicon.png arizonaplantlady@gmail.com2013-09-16 14:30:002016-10-26 14:36:06Landscape "Do's"
With warming temperatures, many of us begin to think about changing out our cool-season annual flowers for plants that can take the heat of summer. Last week, I gave a potting demonstration for attendees of a local home tour. The pots were then to be raffled off. I planned on creating two succulent pots and one using a combination of perennials and annual flowers. My daughter, Rachele, came with me to help carry the bags of soil, pots, plants, etc. It was also an opportunity to spend time together before she left for the Navy. This container has pink-flowering Crown of Thorns, tall Lady’s Slipper, Variegated Elephant’s Food and a gray-colored cactus. I like to create container plantings with a tall plant for vertical interest. The Crown of Thorns provides striking floral color. The Elephant’s Food will trail over the edge of the pot as it grows, which adds texture and softens the container’s lines. Lastly, the gray-colored cactus (I admit that I don’t know what kind it is), adds great color contrast with its gray/blue color. Soon, it was time for the first demonstration. My daughter took photos of me talking. The lighting is terrible because I was in the shade and behind me was the sun, but you can still see what I was doing. Looking down at my notes. Can you tell I use my hands when I talk? Adding Purple Verbena and filling the spaces with Celosia. I just need a bit more Celosia in the front, don’t you think? For this container, the tall vertical interest comes from Mexican Feather Grass. The bright color is from the Calendula. The trailing plant is Purple Verbena and gray Lavender provides the color contrast. I used Celosia to fill in the empty spaces. I was pretty happy with how it turned out. When planning on what plant combinations will look good in a container, I simply arrange the plants, while they are still in their containers at the nursery. Now it was time for planting the second succulent pot. First, adding the Elephant’s Food. Ever wonder how to plant a cactus without getting pricked? An old towel, folded into quarters (4 layers thick) works great. I covered the top of the Golden Barrel Cactus with the towel as I turned it over to plant. The towel came off easily once I was finished. Newspaper is also helpful in planting cactus. The Blue Elf Aloe provides the height for this planting combination. Elephant’s Food will grow to trail over the side. The Golden Barrel cactus adds color contrast with its round shape and yellow spines. Ice plant with brightly-colored red flowers adds a needed splash of color. The pots each went to good homes and raised money for future community projects. Do you like growing plants in containers? Or maybe, you haven’t tried before. Well, it’s not difficult. Come back for a visit in a couple of days and I’ll share with you my container guidelines. I get to meet nice people who let me help them with their landscape. Usually, they want help with plant suggestions, recommended maintenance and sometimes even which plants should be removed. Her back garden was simply beautiful with date palms and gold lantana. Along the back fence, she had created a plant shelf using masonry bricks and wooden planks. She added a some colorful pots filled with golden barrel cacti and other plants. I just loved this idea for masking a bare wall. In the front courtyard, I found a great example of how to grow a plant next to a palm tree (or any kind of tree). Often trees have too many roots that make digging next to them almost impossible. So, this homeowner, simply planted a creeping fig in a container and placed it next to the tree. Lastly, there was a container with Lady’s Slipper (Pedilanthus macrocarpus) growing inside, which softened the side of the garage. This plant does well in full sun and likes deep, infrequent water. Why Do Cactus Have Spines ? What comes to mind when you think of cactus? Perhaps the first thing you think of is the spines. If you have ever been unfortunate enough to have been pricked by a cactus, you’ll likely never forget that most of them have needles. *Did I ever tell you about the time I worked on golf course landscape and backed into a teddy bear cholla and got an entire piece lodged in the back of my leg? Besides being painful to those who get too near to cacti, did you know that there are important reasons that cacti have spines? First, let’s look at the spines of cactus for what they are – the main part of cactus often functions as a modified stem, and its needles are the leaves. The most obvious function of cactus spines is to protect the cacti from animals and people. There are, however, a few animals who aren’t deterred by the sharp spines of cacti such as javelina, tortoises and pack rats. Suprise, the primary function of the spines are to actually shade the cactus. Although just one small spine would hardly provide shade, thousands of them can provide enough. Why is sun protection needed for the surface of cacti? The shade from the spines let the cactus lose water through the atmosphere. This helps keep the cactus temperature relatively low. Another function that the spines serve is that they help certain species of cacti such as cholla to root and spread. Spines of the Cholla are specialized to detach and attach onto anything that comes to close. There are tiny barbs at the tips which grab on to anything that gets too close. It almost appears as if they ‘jump’ off of the main cactus as they latch on the unlucky recipient. Segments of the Cholla are usually moved and then fall off and grow in better conditions. If you have ever seen cholla growing in large groups, this is why. **If like me, you are ever unlucky enough to find a piece of cholla embedded in your clothes or worse, your skin – you can use a comb to help pull out the barbs. When hiking in the desert, it is easy to get them stuck on your shoes. I usually grab a rock and use it to push off the Cholla segment. When all else fails, a good pair of needle-nose pliers works. Two young saguaro cactuses are emerging from the shelter of a creosote shrub. Hopefully, you have a new appreciation for cacti and their spines. But, it’s still important to be careful because it hurts when you get pricked! https://www.azplantlady.com/wp-content/uploads/2009/10/SonoranDesertlandscape.jpg 795 1200 arizonaplantlady@gmail.com http://www.azplantlady.com/wp-content/uploads/2018/10/favicon.png arizonaplantlady@gmail.com2009-10-07 03:22:002019-02-18 10:55:39Why Do Cactus Have Spines ?